The Municipality of North Grenville is pleased to extend an invitation to the community to attend the official opening of the County Road 44 multi-use pathway and pedestrian crossovers on November 19, 2017. 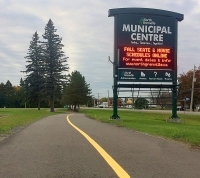 There will be a ribbon cutting ceremony at 12:15 p.m. on the west side of the Municipal Centre (285 County Road 44) with Mayor Gordon and members of the Municipal Council, Ontario Provincial Police, members of the Active Transportation Advisory Committee and Municipal staff. In addition to celebrating the official opening of the pathway, Municipal staff will take the opportunity to provide some education to the community on guidelines for the safe and proper use of the pedestrian crossovers. There will also be demonstrations, games and treats for all to enjoy. Time: 12:00 p.m. - 2 p.m.